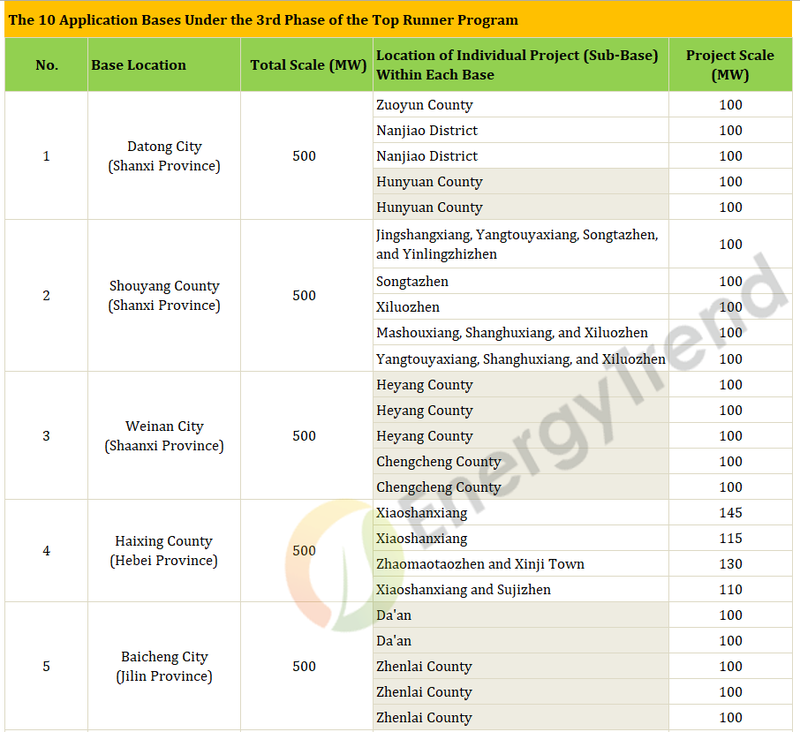 China’s National Energy Administration (NEA) has recently released the official list of proposed projects under the Top Runner Program for 2017. This next (3rd) phase of expansion for the program divides the proposed projects into two categories – those in the application bases and those in the technology bases. The former category aims to have projects offering competitive prices and economic benefits to the local communities, while the latter is about demonstrating next-generation technologies. Each group has its own set of bidding terms and scoring system. In terms of targets, 5GW of projects from the application bases is expected to be connected to the grid by the end of 2018. As for technology bases, 1.5GW of projects within these sites will have to be connected to the grid by the end of June 30, 2019. 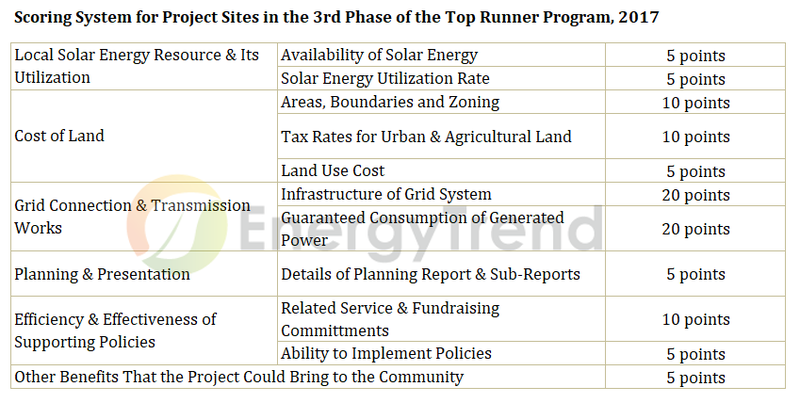 The following is EnergyTrend’s summary of the 3rd phase of the Top Runner Program. We have compiled several tables and key points for readers’ reference. As mentioned earlier, the latest phase of the program will divide the proposed projects into application and technology bases. Their efficiency requirements are listed in the table below. In practice, the Top Runner Program just focuses on the module output requirements. Bidding companies therefore can raise module outputs using other design or manufacturing solutions in addition to improving cell efficiency. Examples of such solutions include modules featuring half-cut or bifacial cells. The locations of projects, whether they belong to application or technology categories, are selected based on the same scoring system as shown in the table below. Based on this scoring system, 13 sites around the country have been selected for the proposed projects. Three sites will be designated as technology bases, while the remaining 10 sites will be designated as application bases. Each site (or base) is either a county or city that accommodates projects or sub-bases that spread across districts within its geographical boundary. The three technology bases are expected to achieve a total capacity of 1.5GW, while the total capacity of all 10 application bases are projected to reach 5GW. 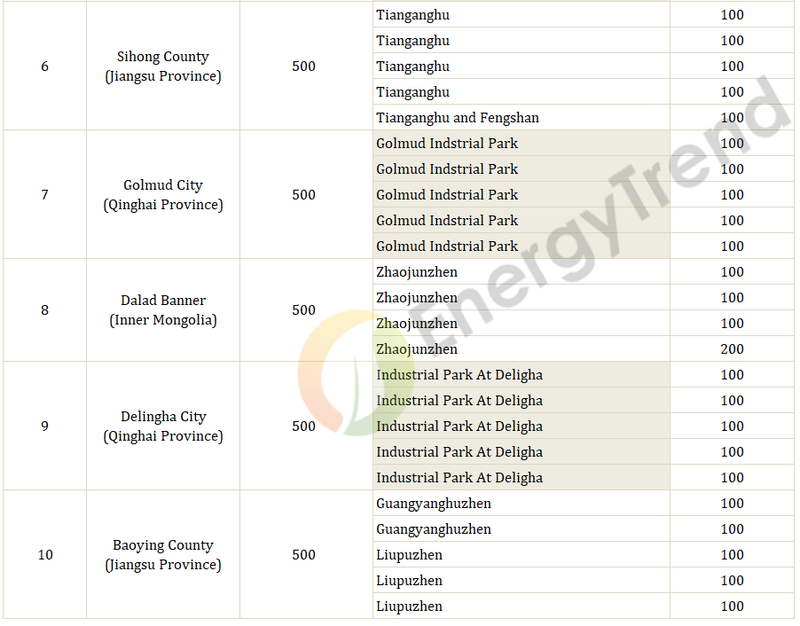 The chosen sites for the proposed projects are listed in the two tables below. Some of the projects are assigned to counties that are identified by the government as “counties in poverty” (marked with shade). The scoring system awards 5 points to base locations that include these areas in poverty under the category of benefits to the community. With few exceptions, most projects in the application bases are 100MW in scale. Scales of respective projects in the technology bases, on the other hand, are all at 250MW. An important thing to note is that the total capacity of all the 13 bases come to just 6.5GW, which is lower than the 8GW earmarked under NEA’s Top Runner target for the 13th Five-Year Plan (2017-2020). Furthermore, NEA explicitly limits the total number of Top Runner bases for 2017 to 13, or no more than 10 for application bases and 3 for technology bases (please refer to the link , in Simplified Chinese). Therefore, the outlook of actual demand related to the Top Runner program remains uncertain for the next few years. In the scoring of project bids, those in the application bases are judged differently from those in the technology bases. On the other hand, they also share some assessment indicators as shown in the table below. In the bidding for projects in the application bases, price rate comprises the largest part of the scoring. According to NEA, rates offered by bidders have to be 10-15% lower than the FIT rate of the municipality or county where the project is set up. Therefore, bidding prices will vary among regions. For example, the highest bid price submitted for the application base in Datong, Shanxi Province, is currently at RMB 0.675/kWh. As for projects in the technology bases, the advanced technology indicator – or the wattage output from next-generation products – accounts for the largest portion of the bid scoring. The implementation schedule and grid-connection deadlines for the proposed Top Runner projects in the 13 bases are shown in the table below. The 5GW of projects in the application bases will have to be connected to the grid at the end of 2018, while the deadline for the 1.5GW of projects in the technology bases is June 30, 2019. NEA’s announcement on the latest bidding terms indicates that there is basically no restriction on the number of bids from a company with regard to projects in the application bases. In the competition for tenders related to application bases, companies that have the advantage are those with experience in developing projects and can control their costs while offering products of consistent quality. These competitors will be more concerned about prices rather than efficiency requirement. Since the deadline for grid connection is set at the end of 2018, bidders will be under pressure to secure tenders and push bid prices to an even lower level. Because of these terms, a company has to spread its bids to different technology bases and can compete for more projects if it has products featuring multiple advanced technologies that are under development (though maximum allowable bids will never exceed the current number of technology bases, that is three). Also, the Chinese government has given a longer schedule for projects in the technology bases since its aim is to promote diversification of solar technologies by giving opportunities to solutions that have not reached the mass production phase. Bid winners for projects in the technology bases will have to start their construction before March 31, 2019. Their projects will be connected to the grid no later than June 30, 2019. This means that bidders will have a 19-month window from now. Furthermore, these demonstration projects are not being scored on their rates versus the existing FIT rates. This presents a great opportunity for developers of next-generation solutions such as HJT, IBC, and MWT.